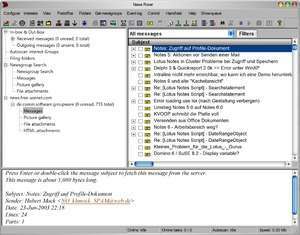 News Rover is a Usenet news reader that features a built-in search service for finding files in any Usenet newsgroup. Just enter keywords and News Rover will find matching files in any newsgroup. News Rover is the ideal tool for downloading MP3 music files, JPG pictures or full-length movies. News Rover currently includes a built-in RAR/PAR processor for handing RAR file posts. News Rover 18 is a shareware program and can be used as a demo to try the software until the free trial period has ended. A full version of the program is available after the trial period ends. For security reasons, you should also check out the News Rover download at LO4D.com which includes virus and malware tests. Additional screenshots of this application download may be available, too.